Recapturing my youth drives my love of RPGs and this week two games have you play the youth of today or yesteryear. One is set in junior high (though, I’m from Georgia and we never called it “junior high”… kindergarten, elementary, middle, high… “junior high” was one of those TV concepts and for years I thought kids in other states went to five levels of school before college… scary…) and the other embraces the kids on bikes subgenre like no other. Combine those with some FATE and Savage Worlds options with good twists and these are worth checking out. Ends on Tue, November 21 2017 4:00 PM EST . “An anthology of tabletop role-playing games, story games, live action games, and other strangeness inspired by the greatest HORROR of all… junior high. THE TRAGED13S OF MIDDLE SCHOOL is an anthology of tabletop role-playing, story games, LARPs, and other strangeness combining classic HORROR TROPES with game mechanics inspired by the greatest horror of all… JUNIOR HIGH!!! Return to middle school without the horror of actually being 13 years old! Each game in The Tragedies of Middle School centers around a nostalgic junior high activity – spin the bottle, Truth or Dare, passing notes, Bloody Mary, school dances, friendship bracelets, etc. The PG-13 horror vibe running throughout represent the fear, awkwardness, and angst of being a thirteen year old. It’s the worst! Other strangeness? In addition to the RPGs, story games, and LARPs, The Tragedies of Middle School features a card game, a Choose Your Own Adventure, a solo dungeon crawler, a sport, a dance party, some craftivities*, and more! *Craftivities are like craft activities – duh! The Tragedies of Middle School currently* features 20 games and activities with more to come as we hit stretch goals throughout the campaign (fingers crossed!). 20 designers and 3 artists, from a diverse mix of backgrounds, are already involved, ready to share their middle school experiences and game styles. THERE ARE EVEN A FEW CURRENT MIDDLE SCHOOLERS! *Our expectation is that we will have 20 games, unless we run out of pages, or the Kickstarter totally goes nuts and we get to unlock some stretch goals. DOWNLOAD HERE – RIGHT NOW! That movie poster cover looks great! I feel like I saw that movie… Anyways, as with Kids on Bikes below, this RPG anthology touches on my most powerful reason to play RPGs – escaping into our never-was-youth. If you want a variety of games – 20 games – and options, this may be the collection for you. Like every RPG on today’s list, this one includes a free sample to test it out on the Kickstarter page. You can find their games on DriveThruRPG here. Ends on Thu, November 23 2017 10:58 AM EST . “Hollowind is a metropolis rich with mysteries and contradictions, where magic is outlawed and whoever makes use of it is hunted down. Hollowind is a vast megalopolis that fifty years ago, thanks to Merlin’s Edict, managed to overthrow the tyranny of arcane families; since that very moment it has been fighting the remaining survivors of the Purge. The Bureaus represent the first line of defense in their daily battle against enemies within and without, observing the motto: order, reveal, and persecute. Anyone attempting to break this new balance, conquered with the blood of thousands, will have to face the Bureaus. The arcanists are always plotting, and people must remain vigilant. The Silence of Hollowind is a Urban Fantasy role playing game, adaptable to many rules systems with the addition of setting-specific mechanics to enhance gameplay (Savage Worlds conversion is the first system we will design for). It is a complex and detailed setting, aesthetically reminiscent of 1930s United States but populated by Orcs, Elves, Dwarves and countless fantasy creatures living within the oppressive Hollowind, a metropolis rich with mysteries and contradictions where magic is outlawed and whoever makes use of it is hunted down as a criminal. The core book for “The Silence of Hollowind” will amount to about 130 pages, which might increase based on the stretch goals. A deeply structured setting, filled with mysteries. Several play styles, from purely investigative games to action-pulp adventures. Playing the role of lowly Order agents, skilled Revealers or brave Persecutors. If stretch goals allow for it, you will be able to play as Arcanists and see things from a different perspective. Dozens of NPCs and ideas for investigative sessions. A variety of conversions for different rule systems. The initial project includes compatibility with Savage Worlds only, but stretch goals may unlock more. Each system conversion will be released through its own free PDF. Layout and art direction aiming to evoke the setting and resemble dossiers from the very Bureaus. A map of the City of Hollowind! You might be wondering why we didn’t simply choose a single existing system, or why we didn’t custom-make one for Hollowind. I can tell you we spent a lot of time on this decision, but in the end we realized we wanted this game to be approachable by as many people as possible, with as little effort as possible. This means relying on widespread systems, allowing every group to choose the one they are most comfortable with. Each rules conversion will provide everything you need to adapt your system to our setting in a few easy steps, keeping your focus on the game, not the conversion. At the same time, we will develop special rules for the Savage Worlds conversion (this is the first system we will design for) such as “Interrogation Scenes”, “Arcane Plague”, “Arcane Fogs” and several Edges dedicated to playing Hollowind. All these rules will be released within a free PDF. This RPG is set in a dieselpunk anti-magic 1930s America and you’re either a hunted mage or the government hunters. It’s for Savage Worlds, 5e, or FATE and should be interesting. Check out the Kickstarter for a quickstart version of the game. Ends on Sun, November 26 2017 3:08 AM EST . “An RPG where modern meets mythic fantasy in two imperiled worlds, where the intrigues of the Courts & Factions play out. A Far Off Land is a multi-world spanning fantasy RPG (roleplaying game) setting by Megan Bennett-Burks and Jacob Possin for the Fate RPG. We will include rules for Apocalypse World / PbtA in a PDF IF we hit the $7000 funding mark. Take the role of one of the Fated; shapeshifting beings which are creatures of both worlds. The Fated are akin to the demigods of legend. Note on add-ons: Want to get extra copies of the book, PDF, or other goodies, see the add-ons section further down. Note on Shipping: Is your Country Not Listed on a Pledge? Contact us, we may still be able to ship to you, but will need to determine an appropriate shipping cost. Curious About Press on the Game? Want to Learn even More? See interviews and more as they are listed in our updates! The world around you is not the only one, and even it is not what it seems. Embrace your twinned nature, creature both eldritch and human. You are a child born of one world and adopted by the other, and fated to save them both. Ah, but, alas, you are much like the world you were born to, also, not what you seem! There are two worlds; one is the world you were born into, the one you’ve taken for granted as mundane and explicable. The other is the Far Off Land; where creatures of myth and magic dwell. This wondrous place was crafted by the gods long ago and has a vast array of Mythic realms which lie within it. You and your companions are Fated, shapeshifting beings who are of both worlds, and the fate of both worlds rests in your hands. One world is that which your character was born into; it is nearly identical to our own present-day earth though it has powerful magic hidden within it. The Fated call this world The Cage because it serves as a prison for slumbering dragons and primordial giants, who would imperil both worlds were they to awaken. Read my interview about A Far Off Land with Megan Bennett-Burks here. I’m interested enough in this project to have done an interview. The idea that you’ll play in two worlds offers a lot of role-playing options and I want to see this make it. I think it has potential as a FATE Core game or as a PbtA option. Need more? You can try the free preview on RPGNow/DriveThruRPG here, A Far Off Land – Preview. Ends on Tue, November 28 2017 9:15 AM EST . “Choose your OWN destiny in this storytelling rules-light tabletop role-playing game where adventure is a bike ride away! Kids on Bikes is a Collaborative World Building RPG set in small towns with big mysteries. Written and created by celebrated game designers Jon Gilmour (Dead of Winter, Atari: Centipede/Missile Command/Asteroids) & Doug Levandowski (Gothic Doctor, Seven Minutes in Hell). Kids on Bikes is a rules-light storytelling system that gets players into the action fast. Kids on Bikes takes place in a more mysterious time, where anything and everything *could* happen. 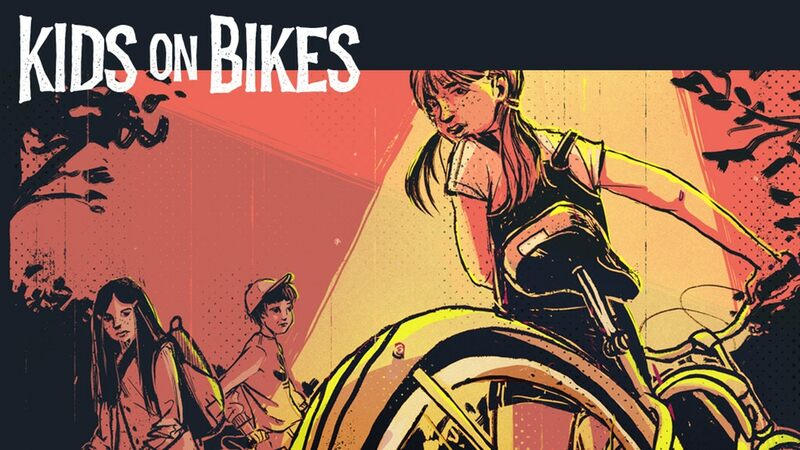 Kids on Bikes is a 60 page, rules-light, fast-paced storytelling game in the spirit of games like DREAD, Perseverant, MONSTERHEARTS, and other great indy titles. Kids on Bikes is perfect for game nights in which you want to get a game in RIGHT NOW. Using stats like GRIT, CHARM, FIGHT, FLIGHT, BRAINS and BRAWN, you’ll jump into the action. Each skill is represented by a polyhedral die based on your character’s competence. More sides = better chance of success. Ends on Sun, November 26 2017 4:00 PM EST. Tagged 9th Level Games, A Far Off Land, Bennett-Burks Design, Infectious Play, Kickstarter, Kids on Bikes RPG, Silence of Hollowind, Tragedies of Middle School.